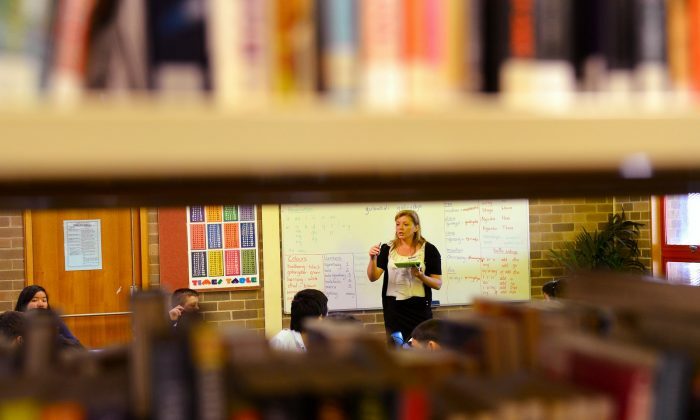 SYDNEY — New South Wales public school teachers have endorsed a new wage agreement that awards the best teachers with a six-figure salary and allows them to move up the pay scale faster. The new award negotiated between the NSW education department and the NSW Teachers Federation provides for a performance-based salary system to take effect from 2016, tying teachers’ pay to performance benchmarks rather than years of service. Classroom teachers accredited as “highly accomplished” will receive the highest pay level of more than $100,000 a year. Teachers will also be able to reach the top salary band faster, after seven years rather than nine. This means that after nine years of work they could earn about $45,000 more per year than under the existing system. Currently teachers hit the maximum pay rate of $89,050 after nine years of service and have to move into administrative roles if they want a higher salary. Director-general of the NSW education department Michelle Bruniges said she hoped the higher pay would allow expert teachers to stay in the classroom. “So valuing those teachers and recognising and rewarding them through a pay scale that keeps them in the classroom is exactly where we want to be in an educational agenda that’s based on valuing the work done in classrooms,” she said. NSW Teachers Federations members voted overwhelmingly to accept the new award on Dec 3, with 96 per cent endorsing the deal. For the next three years, public school teachers will receive a pay rise of 2.27 per cent, 2.0 per cent and 2.15 per cent respectively. Under the deal, principals’ salaries will be adjusted from 2016 to reflect school complexity rather than just school size. “Influences, such as the socio-economic level of a school’s local community, the number of students with a disability and those with a non-English language background, will now be taken into account when classifying principals,” NSW education minister Adrian Piccoli said in a statement. The award also shortens the procedure for dealing with under-performing teachers from 25 weeks to 10 weeks and increases funding for professional development of teachers by 50 per cent to $17 million a year from 2016. NSW Teachers Federation president Maurie Mulheron says that while teachers were satisfied with the pay agreement, they were still unhappy with the state government’s “unfair” public sector salary increase cap of 2.5 per cent a year. “All teachers no doubt would say that barely keeping up with inflation is just not good enough,” he told AAP. Mr Mulheron said union members had asked for a “well-resourced campaign” to challenge the O’Farrell Government on the wage cap next year.